The earth has experienced five mass extinctions before the one we are living through now. In fact, all but the one that killed the dinosaurs involved climate change produced by greenhouse gas. 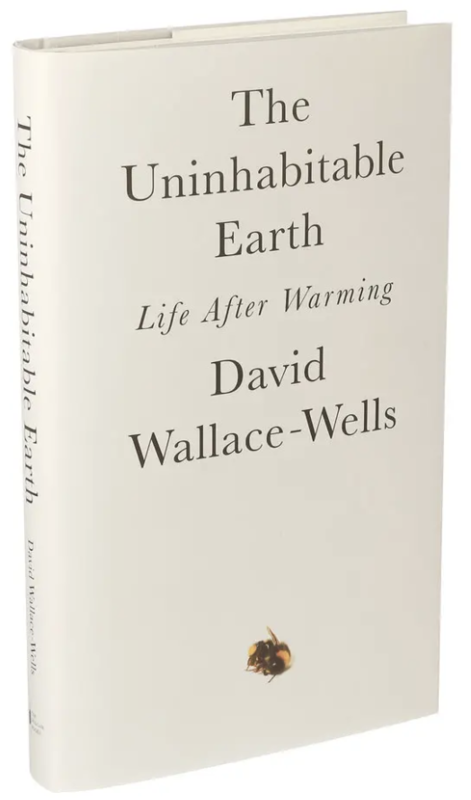 We have done as much damage to the fate of the planet and its ability to sustain human life and civilization since Al Gore published his first book on climate than in all the centuries — all the millennia — that came before. I also always accepted the proposition that there was a trade – off between economic growth and cost to nature and figured, well, in most cases I’d probably go for growth. The U.N . projections are bleaker: 200 million climate refugees by 2050. The Kyoto Protocol achieved, practically, nothing. With no single industrial nation on track to meet its Paris commitments, two degrees looks more like a best – case outcome. We are likely to get about 3.2 degrees of warming. At two degrees, the ice sheets will begin their collapse, 400 million more people will suffer from water scarcity, major cities in the equatorial band of the planet will become unlivable, and even in the northern latitudes heat waves will kill thousands each summer. At three degrees, southern Europe would be in permanent drought, and the average drought in Central America would last nineteen months longer and in the Caribbean twenty – one months longer. In northern Africa, the figure is sixty months longer — five years. The areas burned each year by wildfires would double in the Mediterranean and sextuple, or more, in the United States. By 2100, the United Nations says, we are due for about 4.5 degrees of warming, following the path we are on today. In the late summer of 2017, three major hurricanes arose in the Atlantic at once. Over the past few decades, the term “ Anthropocene ” has climbed out of academic discourse and into the popular imagination. Wally Broecker, the avuncular oceanographer, calls the planet an “ angry beast . ” You could also go with “ war machine . ” Each day we arm it more. A warming planet leads to melting Arctic ice, which means less sunlight reflected back to the sun and more absorbed by a planet warming faster still, which means an ocean less able to absorb atmospheric carbon and so a planet warming faster still. A warming planet will also melt Arctic permafrost, which contains 1.8 trillion tons of carbon, more than twice as much as is currently suspended in the earth’s atmosphere, and some of which, when it thaws and is released, may evaporate as methane, which is thirty – four times as powerful a greenhouse – gas warming blanket as carbon dioxide when judged on the timescale of a century; when judged on the timescale of two decades, it is eighty – six times as powerful. A hotter planet is, on net, bad for plant life, which means what is called “ forest dieback ” — the decline and retreat of jungle basins as big as countries and woods that sprawl for so many miles they used to contain whole folklores — which means a dramatic stripping – back of the planet’s natural ability to absorb carbon and turn it into oxygen, which means still hotter temperatures, which means more dieback, and so on. Higher temperatures means more forest fires means fewer trees means less carbon absorption, means more carbon in the atmosphere, means a hotter planet still — and so on. A warmer planet means more water vapor in the atmosphere, and, water vapor being a greenhouse gas, this brings higher temperatures still — and so on. Warmer oceans can absorb less heat, which means more stays in the air, and contain less oxygen, which is doom for phytoplankton — which does for the ocean what plants do on land, eating carbon and producing oxygen — which leaves us with more carbon, which heats the planet further. And so on. 50,000 people killed by avalanches globally between 2004 and 2016. In the coming decades many of the most punishing climate horrors will indeed hit those least able to respond and recover. Just in Texas, 500,000 poor Latinos live in shantytowns called “ colonias ” with no drainage systems to deal with increased flooding. The poorest countries will suffer more in our hot new world. In just the last forty years, according to the World Wildlife Fund, more than half of the world’s vertebrate animals have died. Andreas Malm calls fossil capitalism. That has been the work of a single generation. The second generation faces a very different task: the project of preserving our collective future, forestalling that devastation and engineering an alternate path. Now we all share the responsibility to write the next act. We may conjure new solutions, which could bring the planet closer to a state we would today regard as merely grim, rather than apocalyptic. I’ve also often been asked whether it’s moral to reproduce in this climate, whether it’s responsible to have children, whether it is fair to the planet or, perhaps more important, to the children. The project of unplugging the entire industrial world from fossil fuels is intimidating, and must be done in fairly short order — by 2040, many scientists say. Inefficiencies in construction, discarded and unused food, electronics, and clothing; two – thirds of American energy is wasted. Americans waste a quarter of their food. Bitcoin; today mining it consumes more electricity than is generated by all the world’s solar panels combined. Seventy percent of the energy produced by the planet, it’s estimated, is lost as waste heat. Less beef, more Teslas, fewer transatlantic flights. Air conditioners and fans already account for fully 10 percent of global electricity consumption. The evacuation of American leadership on climate seems to have mobilized China, which already has the world’s largest footprint. The fattest part of the bell curve of probability, sits at about 3 degrees. Cities, where the world will overwhelmingly live in the near future, only magnify the problem of high temperature. The world is rapidly urbanizing. Currently, there are 354 major cities with average maximum summertime temperatures of 95 degrees. By 2050, that list could grow to 970. For every degree of warming, yields decline by 10 percent. Grain accounts for about 40 percent of the human diet; when you add soybeans and corn, you get up to two-thirds of all human calories. At higher concentrations of carbon, plants grow thicker leaves, which are worse at absorbing CO2. Climate change means staple crops are doing battle with more insects, fungus and disease, not to mention flooding. The world’s natural wheat belt is moving poleward by about 160 miles each decade. Remote areas of Canada and Russia, even if they warmed by a few degrees, would be limited by the quality of soil there, since it takes many centuries for the planet to produce optimally fertile dirt. The climate is changing much too fast to wait for the northern soil to catch up. In the United States, the rate of erosion is ten times as high as the natural replenishment rate; in China and India, it is thirty to forty times as fast. The Saharan desert has expanded by 10 percent. Paul Ehrlich wrote The Population Bomb. It may yet be a bit early to judge Ehrlich. The cruelest impacts of climate change will be borne by those least resilient in the face of climate tragedy. Our global climate fate will be shaped so overwhelmingly by the development patterns of China and India. They will need to turn down cheap electrification, automobile culture, and the protein – heavy diets the world’s wealthy rely on to stay thin. Drought may be an even bigger problem for food production than heat. At 2.5 degrees, thanks mostly to drought, the world could enter a global food deficit — needing more calories than the planet can produce. Unprecedented droughts and unprecedented flood – producing rains. Europe will be in permanent extreme drought, much worse than the American Dust Bowl ever was. Droughts in the American plains and Southwest would not just be worse than in the 1930s, a 2015 NASA study predicte , but worse than any droughts in a thousand years. Africa is today straining to feed about 1 billion people. In the United States , you already hear about the prospects for vertical farming and lab-grown protein. CO2 can make plants bigger, but those bigger plants are less nutritious. Protein deficiency will be the result of nutrient collapse due to carbon concentrations. Barring a reduction of emissions, we could see at least four feet of sea – level rise and possibly eight by the end of the century. In The Water Will Come, Jeff Goodell writes about this. By 2100, if we do not halt emissions, as much as 5 percent of the world’s population will be flooded every single year. Much of the infrastructure of the internet could be drowned by sea – level rise in less than two decades. 311,000 homes in the United States would be at risk of chronic inundation by 2045. The planet would lose about 444,000 square miles of land. Twenty cities most affected by such sea – level rise are all Asian megalopolises. Power plants, ports, navy bases, farmlands, fisheries, river deltas, marshlands, and rice paddies. Even river flooding is a danger due to increased global rainfall. In 2017, the National Oceanic and Atmospheric Administration ( NOAA ) suggested eight feet was possible — still just in this century. In 2016, climate scientist James Hansen suggested sea levels could rise by several meters over 50 years if ice melt doubled every decade. The breaking – up of ice represents almost an entirely new physics, poorly understood still. One major concern is methane, released by a melting Arctic. Atmospheric methane levels have risen dramatically in recent years. The permafrost line having retreated eighty miles north in Canada over the last fifty years. The “ albedo effect ” is when ice is white and so reflects sunlight back into space rather than absorbing it. The less ice, the more sunlight is absorbed as global warming. The total disappearance of that ice, Peter Wadhams has estimated, could mean a massive warming equivalent to the entire last twenty – five years of global carbon emissions. Ocean chemist David Archer says that at just three degrees of warming, sea – level rise will be at least fifty meters. In many places , the coast would retreat by as much as one hundred miles. More than 600 million people live within thirty feet of sea level today . Five of the twenty worst fires in California history hit the state in the fall of 2017. Americans watched the Kardashians evacuate via Instagram stories, then read about the private firefighting forces they employed, the rest of the state reliant on conscripted convicts earning as little as a dollar a day. United States has, to this point, been mostly protected from the devastation climate change. What is coming ? Much more fire, much more often, burning much more land. For every additional degree of global warming , areas burned could quadruple. The soot and ash wildfires give off can land on and blacken ice sheets, which then absorb more of the sun’s rays and melt more quickly. Mudslides are among the clearest illustrations of what new horrors that heralds. Each year, globally, between 260,000 and 600,000 people die from smoke from wildfires. Drinking water in Colorado was damaged for years by the fallout from a single wildfire in 2002. When trees die — by natural processes, by fire, at the hands of humans — they release into the atmosphere the carbon stored within them. The trees of the Amazon take in a quarter of all the carbon absorbed by the planet’s forests each year. Jair Bolsonaro was elected president of Brazil promising to open the rain forest to development — Bolsonaro’s policy is the equivalent of adding, if just for a year, a whole second China to the planet’s fossil fuel problem — and, on top of that, a whole second United States. Deforestation accounts for about 12 percent of carbon emissions, and forest fires produce as much as 25 percent. .
Every square kilometer of deforestation produces twenty-seven additional cases of malaria, thanks to what is called “vector proliferation” — when the trees are cleared out, the bugs move in. Each climate threat promises to trigger similarly brutal cycles. We’ll have to invent new categories for stronger hurricanes. The summer of 2017, in the Northern Hemisphere, brought unprecedented extreme weather. Glacier National Park in Montana, where temperatures also topped 100. In 1850, the area had 150 glaciers; today, all but 26 are melted. Once-unthinkable outlier events much more common. The link between climate change and deluges or even “rain bombs” — is even clearer than those on hurricanes. Warmer air can hold more moisture than cooler air. Trump barely mentioned Puerto Rico in the week after Maria, and while that may not surprise, neither did the Sunday talk shows. With Houston and New Orleans, we tell ourselves we are “developing” the land — in some cases, fabricating it from marsh, but we are really just creating more future natural disasters. Because of Hurricane Harvey nearly half a billion gallons of industrial wastewater surged out of a single petrochemical plant into Galveston Bay. Louisiana loses a football field of land every single hour. Barely more than 2 percent of the planet’s water is fresh, and only 1 percent of that water, at most, is accessible, with the rest trapped mostly in glaciers. Only 0.007 percent of the planet’s water is available to fuel and feed its seven billion people. In many African countries already, you are expected to get by on as little as twenty liters of water each day. As soon as 2030, global water demand is expected to outstrip supply by 40 percent. Water is still an abundant resource made scarce through governmental neglect and indifference, bad infrastructure and contamination, careless urbanization and development. There is no real need for a water crisis. In the United States, leaks and theft account for an estimated loss of 16 percent of freshwater. 2.1 billion people around the world do not have access to safe drinking water. There could be widespread water shortages in Peru and California that are the result of glacier melt, even if we hit our Paris targets. Even London is beginning to worry over water shortages. In the last 100 years, many of the planet’s largest lakes have begun drying up. The blooming of warmwater-friendly bacteria threatens the water supply. Warming of East Africa’s Lake Tanganyika imperiled the fish stock harvested and eaten by millions in four adjacent, hungry nations. We drain underground water deposits known as aquifers, but those deposits took millions of years to accumulate and aren’t coming back anytime soon. The Ogallala Aquifer in part of the Texas Panhandle lost 15 feet in a decade. In India, in just the next two years, twenty-one cities could exhaust their groundwater supply. The first Day Zero in Cape Town was in March 2018. It gets worse. Personal consumption of freshwater amounts to such a thin sliver that only in the most extreme droughts can it even make a difference. Staggering amounts of water are needed produce South Africa’s wine crop. In California, where droughts are punctuated by outrage over pools and ever-green lawns, total urban consumption still accounts for only 10 percent. Rice and cotton production in Southern Australia fell 99 and 84 percent in a recent eight-year drought. In 2018, in the Indian city of Shimla, once the summertime home of the British Raj, the taps ran dry for weeks in May and June. While agriculture is hit hardest by shortages, water issues are not exclusively rural. We are more aware of the effects of climate change on oceans, but a freshwater crisis is more alarming, since we depend on it far more acutely. Over the next three decades, water demand from the global food system is expected to increase by about 50 percent, from cities and industry by 50 to 70 percent, and from energy by 85 percent. The five-year Syrian drought that stretched from 2006 to 2011, producing crop failures that created political instability and helped usher in the civil war that produced a global refugee crisis. Oceans also maintain our planetary seasons, through prehistoric currents like the Gulf Stream, and modulate the temperature of the planet, absorbing much of the heat of the sun. Fish populations have migrated north by hundreds of miles in search of colder waters. More than a fourth of the carbon emitted by humans is sucked up by the oceans. Ocean acidification could add between a quarter and half of a degree of warming. “Coral bleaching” — since 2016, half of Australia’s landmark Great Barrier Reef has been stripped. By 2030 ocean warming and acidification will threaten 90 percent of all reefs. Ocean acidification will also damage fish populations directly. Oysters and mussels will struggle to grow their shells. Off the coasts of Australia, fish populations have declined an estimated 32 percent in just ten years. Warmer waters can carry less oxygen. Runoff of fertilizer chemicals washing into the Mississippi from the industrial farms of the Midwest. Dramatic declines in ocean oxygen have played a role in many of the planet’s worst mass extinctions. With CO2 at 930 parts per million (more than double where we are today), cognitive ability declines by 21 percent. The planet’s air won’t just be warmer, it will likely also be dirtier. Climate change will bring new dust storms and ozone smog. Already, more than 10,000 people die from air pollution daily. Small-particulate pollution, for instance, lowers cognitive performance. Pollution has been linked with increased mental illness in children and the likelihood of dementia in adults. Pollution is linked to premature births and low birth weight of babies. EZPass in American cities reduced both problems, in the vicinity of toll plazas, by 10.8 percent and 11.8 percent. Changing weather patterns will deprive industrial China of the natural wind-ventilation patterns. In 2013, smog was responsible for 1.37 million deaths in the country. The Indian capital of Delhi is home to 26 million people. In 2017, simply breathing its air was the equivalent of smoking more than two packs of cigarettes a day. Pollution can dramatically increase rates of respiratory infections. Pollution increases prevalence of stroke, heart disease, cancer of all kinds, acute and chronic respiratory diseases like asthma. Air pollution has been linked to worse memory, attention, and vocabulary, and to ADHD and autism spectrum disorders. Proximity to a coal plant can deform your DNA. A new pollution threat, though unrelated to global warming: microplastics. The Great Pacific garbage patch is mass of plastic, twice the size of Texas. A quarter of fish sold in Indonesia and California contain plastics. European eaters of shellfish , one estimate has suggested , consume at least 11,000 bits each year . A majority of fish tested in the Great Lakes contained microplastics. Microplastics have been found in beer, honey, and sixteen of seventeen tested brands of commercial sea salt, across eight different countries. We can breathe in microplastics, even when indoors, where they’ve been detected suspended in the air, and do already drink them. They are found in the tap water of 94 percent of all tested American cities. When plastics degrade, they release methane and ethylene, another powerful greenhouse gas. Perversely, eliminate aerosol plastic pollution and you save millions of lives each year, but also create a dramatic spike in warming. The prospect of suppressing global temperature with a program of suspended particles (sulfur dioxide) is called geoengineering. Sulfur dioxide would turn our sunsets very red, would bleach the sky, and would make more acid rain. Many scientists still describe geoengineering as an inevitability — it’s just so cheap , they say. There are now, trapped in Arctic ice, diseases that have not circulated in the air for millions of years. Our immune systems would have no idea how to fight back when those prehistoric plagues emerge. Smallpox and the bubonic plague are trapped in Siberian ice. in 2016, a boy was killed and twenty others infected by anthrax released when retreating permafrost exposed the frozen carcass of a reindeer killed by the bacteria at least seventy-five years earlier. Global warming will scramble those ecosystems, meaning it will help disease trespass those limits. Yellow fever is just one of the plagues that will be carried by mosquitoes as they migrate. Zika may also be a good model of a second worrying effect — disease mutation. Malaria thrives in hotter regions. Disease cases from mosquitoes, ticks, and fleas have tripled in the U.S. over just the last thirteen years. Winter ticks helped drop the moose population by 58 percent in a single decade. A whole new universe of diseases humans have never before known to even worry about. The planet could harbor more than a million yet-to-be-discovered viruses. Saiga — the adorable, dwarflike antelope, native to central Asia. In May 2015, nearly two-thirds of the global population died in the span of just days due to Pasteurella multocida, which suddenly proliferated, emigrated to the bloodstream, and from there to the animals’ liver, kidneys, and spleen. Fossil capitalism is the idea that recent economic growth, which began somewhat suddenly in the eighteenth century, is not the result of innovation or the dynamics of free trade, but simply our discovery of fossil fuels and all their raw power — a onetime injection. We tend to believe we’ve invented our way out of that endless zero-sum , scratch-and-claw resource scramble. The timeline of growth is just about perfectly consistent with the burning of fossil fuels. Economists Solomon Hsiang and Marshall Burke and Edward Miguel say every degree Celsius of warming reduces growth, on average, by about one percentage point. There is a 51 percent chance, this research suggests, that climate change will reduce global output by more than 20 percent by 2100. 12 percent chance that it lowers per capita GDP by 50 percent. The Great Depression dropped global GDP by about 15 percent. We’ve become so used to economic stability and reliable growth. There are places that benefit from global warming such as in the north, where warmer temperatures can improve agriculture and economic productivity. If productivity declines, small farms disappear and even large agribusinesses slip underwater. Then there is the economic cost of flooding. The is also a direct heat cost to growth, as there is to health. Train tracks warp due to heat, grounding of flights due to temperatures. Every round-trip plane ticket from New York to London costs the Arctic three more square meters of ice. Heat waves have necessitated the closure of power plants around the world. The planet’s infrastructure was simply not built for climate change. Warmer temperatures dampen worker productivity. India and Pakistan will be hurt the most. In the U.S., costs will be shouldered largely in the South and Midwest. The United States is among the most well-positioned to endure. Should the planet warm 3.7 degrees, one assessment suggests, climate change damages could total $551 trillion — nearly twice as much wealth as exists in the world today. For every half degree of warming, they say, societies will see between a 10 and 20 percent increase in the likelihood of armed conflict. A planet four degrees warmer would have perhaps twice as many wars. Globally, there are nineteen ongoing armed conflicts hot enough to claim at least a thousand lives each year. Being the world’s policeman is quite a bit harder when the crime rate doubles. From Book Haram to ISIS to the Taliban to militant Islamic groups in Pakistan, drought and crop failure have been linked to radicalization. The relationship between climate change and conflict comes down to agriculture and economics. When yields drop and productivity falls, societies can falter, and when droughts and heat waves hit, the shocks can be felt even more deeply, electrifying political fault lines. Forced migration can result from those shocks, producing political and social instability. Throughout history, empires buckled, at least in part, by climate effects and events: Egypt, Akkadia, Rome. Most wars throughout history have been conflicts over resources, often ignited by resource scarcity , which is what an earth densely populated and denuded by climate change will yield. A study of 9,000 American cities found that air pollution levels positively predicted incidents of every single crime category. The Sicilian mafia was produced by drought. Hurricane Harvey produced at least 60,000 climate migrants in Texas, and Hurricane Irma forced the evacuation of nearly 7 million. Imagine next century, tens of millions of resettled Americans adapting to a ravaged coastline and a new geography for the country. The impacts will be greatest in the world’s least developed, most impoverished nations. More than 140 million people in just three regions of the world will be made climate migrants by 2050, according to the World Bank. Climate change may unleash as many as a billion migrants on the world by 2050. Historically, two-thirds of outbreaks of waterborne disease — illnesses smuggled into humans through algae and bacteria that can produce gastrointestinal problems — were preceded by unusually intense rainfall. Sudden rainfall shocks — both deluges and their opposite , droughts — can devastate agricultural communities economically, but also produce what scientists call “nutritional deficiencies” in fetuses and infants. Measurable declines in lifetime earnings for every day over ninety degrees during a baby’s nine months in utero. A study in Taiwan found, for every single unit of additional air pollution, the relative risk of Alzheimer’s doubled. There is much worry about bringing new children into a degraded world. Between a quarter and a half of all those exposed to extreme weather events will experience them as an ongoing negative shock to their mental health. Climate trauma is especially harsh in the young. Climate affects both the onset and the severity of depression. When it’s hotter out, psychiatric hospitals see spikes in proper inpatient admissions. Heat waves bring waves of other things, too: mood disorders, anxiety disorders, dementia. Global warming is already responsible for 59,000 suicides in India , many of them farmers. There remains so much we do not know about the way global warming affects the way we live today. Dramas of climate change are simply incompatible with the kinds of stories we tell ourselves about ourselves, which end in victory or hope. In the rest of the world, where action on carbon is just as slow and resistance to real policy changes just as strong, denial is simply not a problem. Today, segments on the nightly news about extreme weather still rarely mention warming. A ban on plastic straws and attention to bee death tend to distract from the core issues. The arrival of this scale of climate suffering in the modern West will be one of the great and terrible stories of the coming decades. In the twenty-first century, markets will reflect the demands of the climate crisis: seawalls, carbon-capture plantations, state-sized solar arrays. The United States built two states of paradise: Florida, out of dismal swamp and Southern California, out of desert, but neither will endure. 96% of the world’s mammals, by weight, are now humans and their livestock. There is no single way to best tell the story of climate change. In 2018, scientists at IPCC released a report. The thing that was new was the message: It is okay, finally, to freak out. Capitalism is endangered by climate. Western capitalism may owe its dominance to the power of fossil fuels. Global warming could cultivate emergent forms of eco-socialism. What kind of strategy to expect from the world’s money elite in a time of rolling ecological crisis? Look to Puerto Rico. One possibility is that the scramble for shrinking profits by the powerful will only intensify. Climate change will accelerate two trends already undermining that promise of growth: economic slowdown and income inequality. We see raging populism, on both left and right, sweeping Europe and the United States. William Nordhaus favors a carbon tax. Climate change predicts: disaster, drought, famine, war, global refugeeism and political disarray. Climate change promises economic slowdown and perhaps negative economic growth. Economic conditions worse than the Great Depression and not temporary but permanent. The cost of adaptation is large: a decarbonized economy, a perfectly renewable energy system, a reimagined system of agriculture, rebuilt global infrastructure. Negative emissions are, at this point, almost entirely theoretical. The natural alternative to negative emission technology, though adored by environmentalists, faces much stiffer obstacles, since it would require a third of the world’s farmable land. The carbon capture path would cost $ 300 trillion — or nearly four times total global GDP. Blind faith is one way of describing the worldview of many futurists. “Posthumanity” or “transhumanism”, a new state of being, is close to universal among the Bay Area’s futurist vanguard. Peter Thiel is still investing in dubious eternal-youth programs and buying up land in New Zealand (where he might ride out social collapse on the civilization scale). Silicon Valley wants to engineer an eternal kind of existence, a technological rapture. The world that would be left behind is the one being presently pummeled by climate change. There are also proposals to colonize other planets. The fantasy is to escape the body or transcend the world. Securing a backup ecosystem is a hedge against the possibility of collapse here, but a dramatically degraded environment here will still be much, much closer to livability than anything we might be able to hack out of the dry red soil of Mars. We have some of the solutions, but we just haven’t yet discovered the political will, economic might, and cultural flexibility to install and activate them. Cryptocurrency now produces as much CO2 each year as a million transatlantic flights. All of the new alternatives have to face off with the resistance of entrenched corporate interests and the status-quo bias of consumers who are relatively happy with the lives they have today. We won’t get there through the dietary choices of individuals, but through policy changes. Eating organic is nice, but if your goal is to save the climate your vote is much more important. What kinds of politics are likely to evolve after the promise of capitalistic growth recedes? Zero-sum politics — tribalism at home and nationalism abroad and terrorism flaming out from the tinder of failed states. China has become a much more emphatic — or at least louder — green energy leader. But the incentives do not necessarily suggest it will make good on that rhetoric. India is expected to be, by far, the world’s most hard-hit country. China is in the opposite situation, its share of guilt four times as high as its share of the burden. U.S. was predicted to be hit second hardest. On the matter of climate change, China does hold nearly all the cards. The courses taken by India and the rest of South Asia, Nigeria and the rest of sub-Saharan Africa, matter enormously. But China is, at present, the largest of those nations. There is no good thing in the world that will be made more abundant, or spread more widely, by global warming. The list of the bad things that will proliferate is innumerable. We are still, now, in much of the world, shorter, sicker, and dying younger than our hunter-gatherer forebears. The entire history of civilization looks less like an inevitable crescendo than like an anomaly. It is impossible to see clearly what will emerge from the clouds of uncertainty around global warming. If the planet reaches three or four or five degrees of warming, the world will be convulsed with human suffering. Civilizations have come and gone. Egyptians after the invasion of the Sea Peoples. Incas after Pizarro. Mesopotamians after the Akkadian Empire. Chinese after the Tang Dynasty. The experience of Europeans after the fall of Rome. Anxiety and despair are already leeching into the way so many others think. The world has, at most, about three decades to completely decarbonize before truly devastating climate horrors begin. Climate science has reluctantly arrived at this terrifying conclusion. How much will we do to stall disaster, and how quickly? We have all the tools we need: carbon tax and the political apparatus to aggressively phase out dirty energy; a new approach to agricultural practices and a shift away from beef and dairy in the global diet; and public investment in green energy and carbon capture.